Beautiful and evocative and recorded in his home-town of Liverpool between March 2016 and June 2017, the album is the culmination of four years of hard work. Equal to his finest moments, Adiós Señor Pussycat will undoubtedly only further cement his reputation as one of this generations greatest songwriters. Since a self-imposed hiatus in 2008, Michael Head has been working with a fluid concept of an ever-rotating band format to provide a flexible platform for the range of his new live and recorded works. ‘Under the guise of Michael Head & The Red Elastic Band in 2013, they released their sought-after debut EP, Artorius Revisited, and followed this with a double A sided 7”, Velvets In The Dark / Koala Bears in 2015. 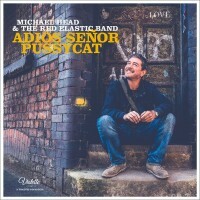 He also released, what is often regarded as his classic album, The Magical World Of The Strands under the name of Michael Head & The Strands in 1997, and with Shack currently on hiatus he has been performing under the Red Elastic Band guise for the past few years. Andy says: Good things come to those who wait! It's been 11 long years and here it is: a modern day singer-songwriter, folk pop classic! Sounding closer to his work as The Strands than Shack, this uses his love of The Byrds and late-60's folkies to create a modern masterpiece, timeless and true. Our "Greatest Living Songwriter" (thanks NME!) has delivered. It better hadn't be 11 years 'til the next one!